Ah, Florida…land of waders and waterfowl. 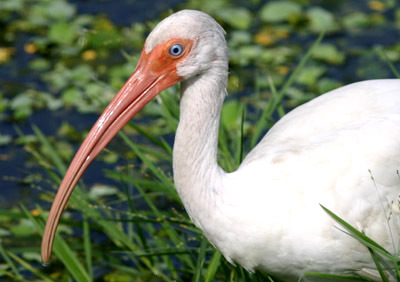 Is there an American heron or egret that hasn’t made a home in the Sunshine State? Business brought me to the Palm Beach area, an ever-expanding commercial zone that might charitably be described as a wasteland of strip malls and ostentatious development. This part of the state isn’t all bad though, as it’s well within striking distance of exceptional birding habitat. Even in summer, species abound here that just cannot be seen anywhere else in the continental US. When one thinks of Florida’s natural history, one of the first words that has to come to mind is Everglades. I dearly wanted to enjoy a slice of this storied marsh (did you know that it’s not a swamp?) so I set out at dawn for the Arthur R. Marshall Loxahatchee National Wildlife Refuge. Actually, the trip itself revealed an abundance of just the kind of birds I sought. Flocks of ibis (White and Glossy) and grackles (Boat-tailed and Common) flew across the highway while White-winged and Mourning Doves perched along telephone wires. I even spotted my first Loggerhead Shrike en route to the refuge, a handsome, bandit-masked bird perched imperiously on a pine top. At first, I wasn’t too impressed with Loxahatchee. To be more specific, I was extremely impressed by the quartet of Everglades Snail Kites flying past when I entered, but then suffered a momentary let-down. Strolling the boardwalk through a beautifully austere cypress swamp, I encountered only chatty Carolina Wrens, noisy Northern Cardinals, and a mob of bloodthirsty insects more than willing to take advantage of a moron who left his bug spray behind. But the cypresses aren’t official Everglades habitat anyway. Once I hit the Marsh Trail, essentially a grid segmenting a vast expanse of grassy wetlands into manageable square tracts, the local specialties really started to turn up. Long-legged waders loom large in Loxahatchee. 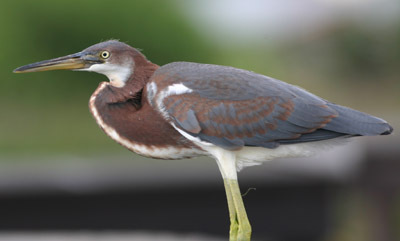 Great Egret, Snowy Egret, Cattle Egret, Great Blue Heron, Little Blue Heron, Tricolored Heron, Green Heron, and Black-crowned Night-heron approached from every angle, whether soaring casually above, perched in trees, or hunting for fish, frogs, and other marsh delicacies. None of them got too close, but thankfully, the ubiquitous Anhinga didn’t share that reticence. Snakeheads, as these sinuous, singular birds are called, could be found everywhere in this stretch of the Everglades and beyond. 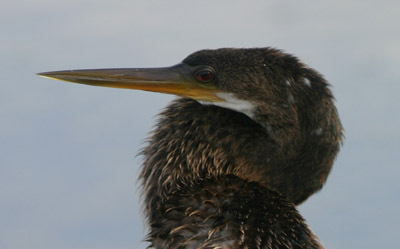 If I wasn’t actually on a major road or indoors in the greater Palm Beach area, an anhinga was probably somewhere in sight. What I loved about this refuge was that, even though birds didn’t appear in great numbers, all the good ones put in guest appearances. Fulvous Whistling-Ducks and Mottled Ducks, my first of each, made the scene, while, for once, Mallard did not. Among the copious Common Moorhen appeared the occasional Purple Gallinule, that superstar of Neotropical wetlands. Even the usual Red-tailed Hawks gave way to more prevalent Red-shouldered Hawks, though Turkey Vultures were as numerous as ever. I noted Red-bellied, Downy, and Pileated Woodpeckers but few songbirds beyond Barn Swallow, Blue Jay, Fish Crow, Northern Mockingbird, Brown Thrasher, and of course, Red-winged Blackbird. The butterflies and other insect life were amazing too, if you’re into that sort of thing! 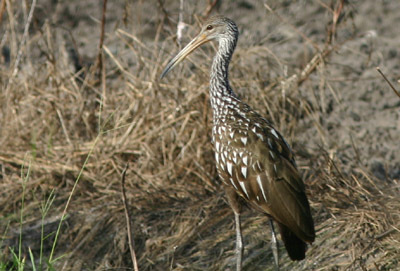 Though I feared I had missed it, I spotted a sensational Limpkin on my way out. I’m not sure exactly what a limpkin is, but it is quite a looker, chocolate brown dappled with cunning white triangles and armed with a considerable curved bill. So enamored was I with this roadside attraction that I completely forgot that I was also looking for Swallow-tailed Kites until one flew directly overhead. Too stunned to catch a photo, I simply enjoyed the sight of this elegant yet unexpectedly large raptor with its telltale tail soaring towards the horizon. Where Are You Birding This Last Weekend of August 2010? What is the National Bird of Britain?